The Dim Sum Diaries | ABC Kitchen | "One cannot think well, love well, sleep well, if one has not dined well." Hong Kong is without a doubt a very funny place. Everywhere you look you’ll find a complete mish mash of cultures attempting, and succeeding, to coexist in the same location. 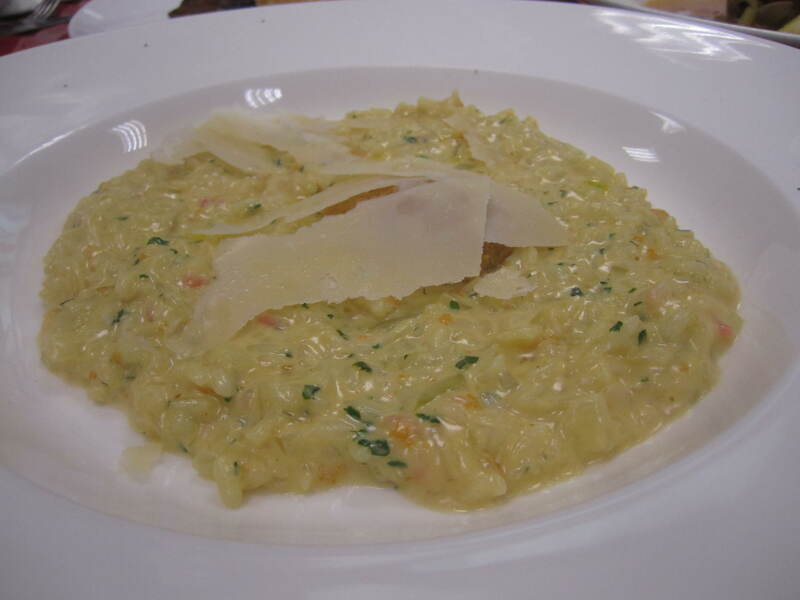 What you perhaps won’t expect to find, though, is a very good Italian restaurant in a cooked food market. 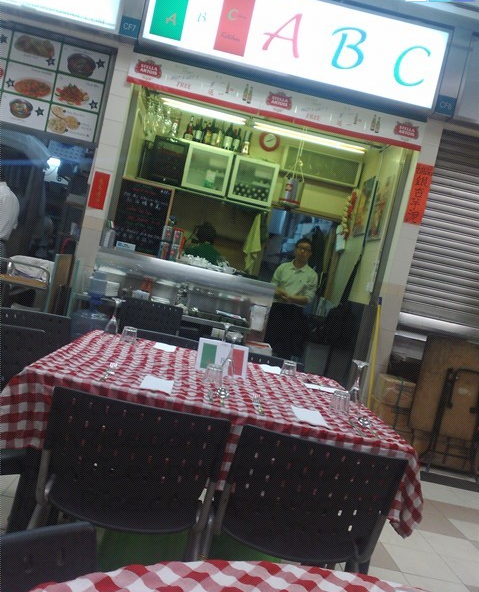 The Queen Street Cooked Food Market in Sheung Wan, however, has shown us that this is possible, as ABC Kitchen resides amidst the usual throng of very local dai pai dongs common to all cooked food markets. ABC Kitchen – the acronym for A Better Cooking Kitchen – is run by two former chefs from what used to be M at the Fringe. Sadly I never got to taste M, so can’t give you my first hand comparison between the two, but from what I understand, they have brought their most popular dishes to ABC, where they continue to be just as popular. ABC knows that it’s too good for a cooked food market, as it is the only ‘restaurant’ in there with tablecloths and proper crockery. I think the sheer location of it, however, is all part of its appeal and success. Although on the front of the menu it claims they serve pizza and pasta, inside the menu neither were an option. Apparently these are served at lunchtime, whereas for dinner, finer choices such as the signature dish of suckling pig are offered. Judging by the size of the starters that drifted past our table, we decided to share three between the five of us. 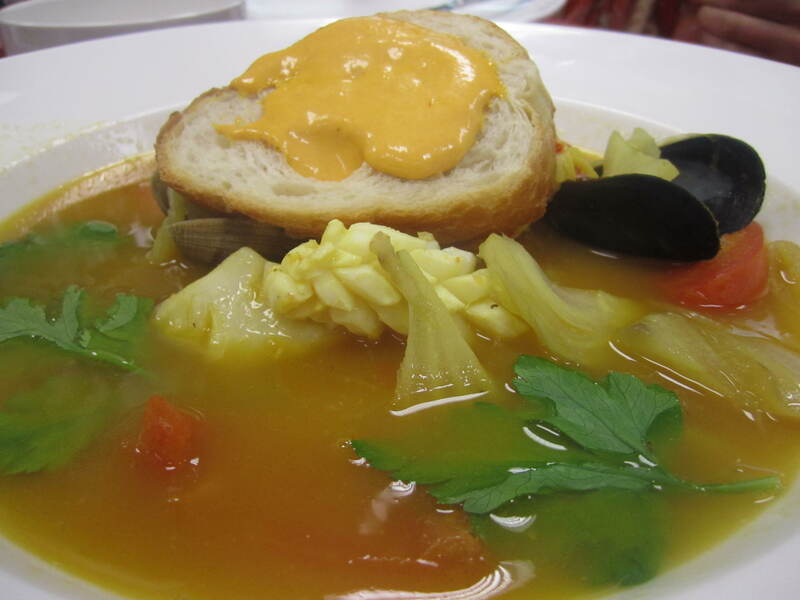 I shall start with my least favourite: the Provencal fish stew. I normally associate stew with a slightly thicker liquid, whereas this had more of a broth consistency. Nevertheless, said broth had a delicious fennel taste and ample amounts of squid, clams and mussels. Unfortunately, it was served tepid, which really let it down. 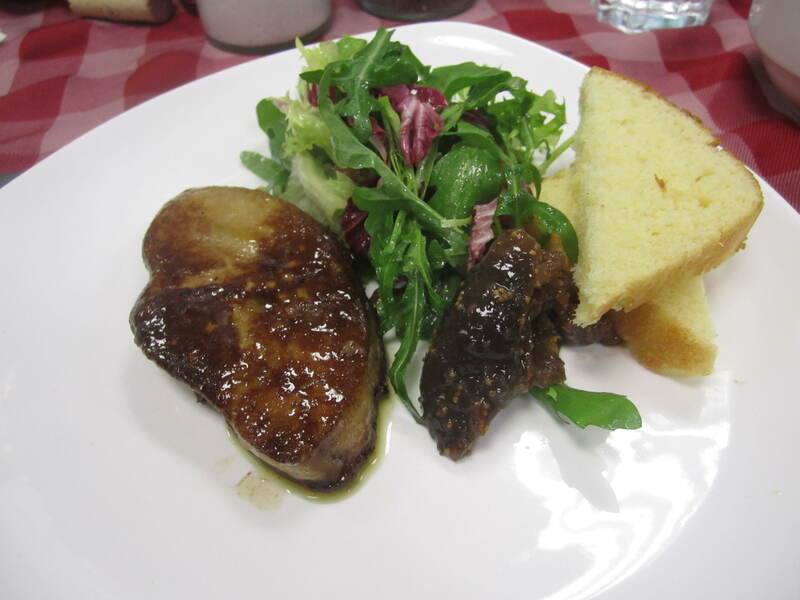 The Pan-fried foie gras was faultlessly smooth and light, paired with a sweet fig jam and a lightly dressed salad. Unfortunately this too was not served hot. After complaining about the temperature of the starters, the apologetic waiters made sure to bring the main courses piping hot. 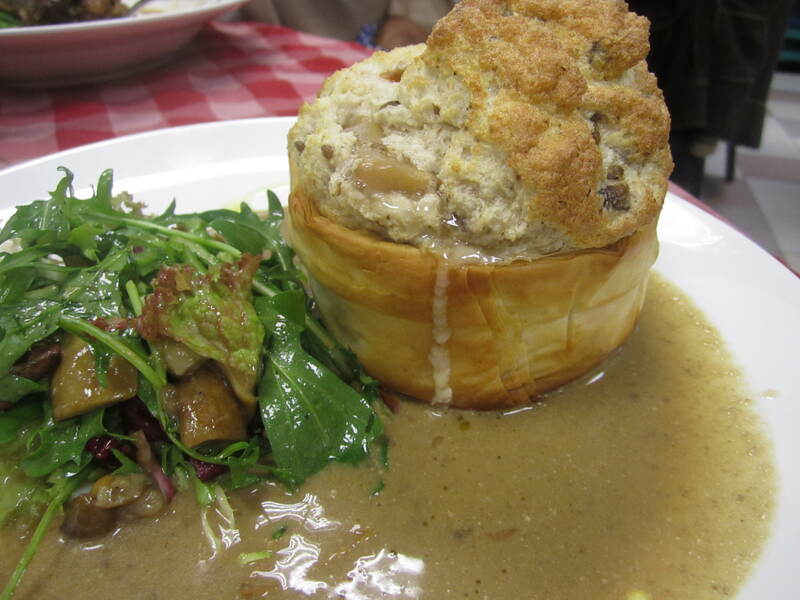 The Porcini soufflé was a beautiful sight: perfectly risen and wrapped in sheets of paper-thin filo pastry. Although it was served with a creamy mushroom sauce, the flavour of so many mushrooms was by no means overpowering. 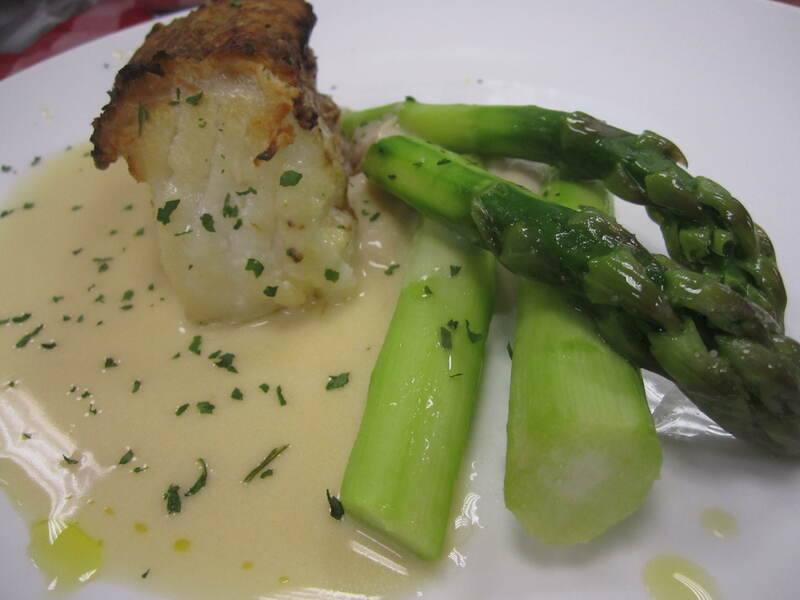 The Seared sea bass, served in a lemon butter sauce, was wonderfully flaky with a light, delicate flavour. I’m not normally a fish-skin person, but here the skin was so crispy and delicious that it could actually be eaten on its own. Having been assured that the bird came from France and not the streets of Hong Kong, my mother tried the Pan-roasted pigeon. 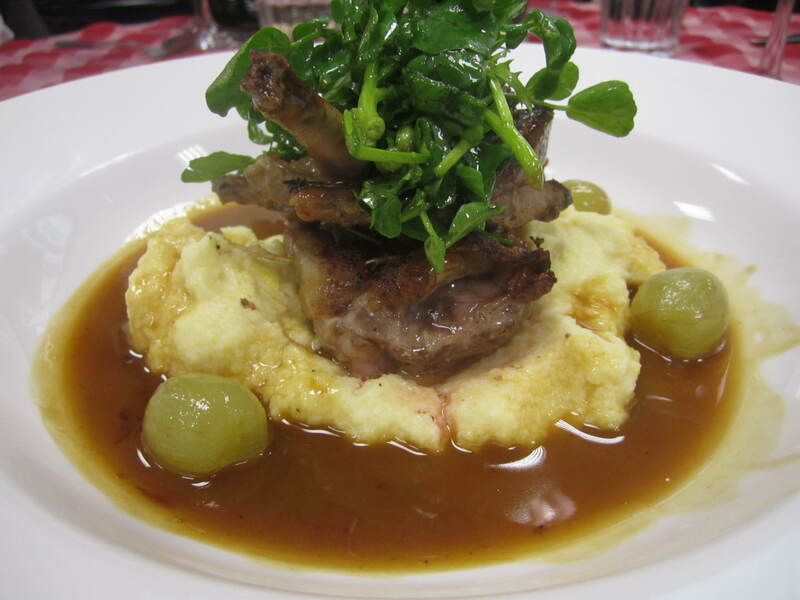 This little bird had such a succulent and rich flavour that was enhanced by the delicious jus and huge, sweet grapes. There is no way to fault this dish. On to the Lamb shank…. 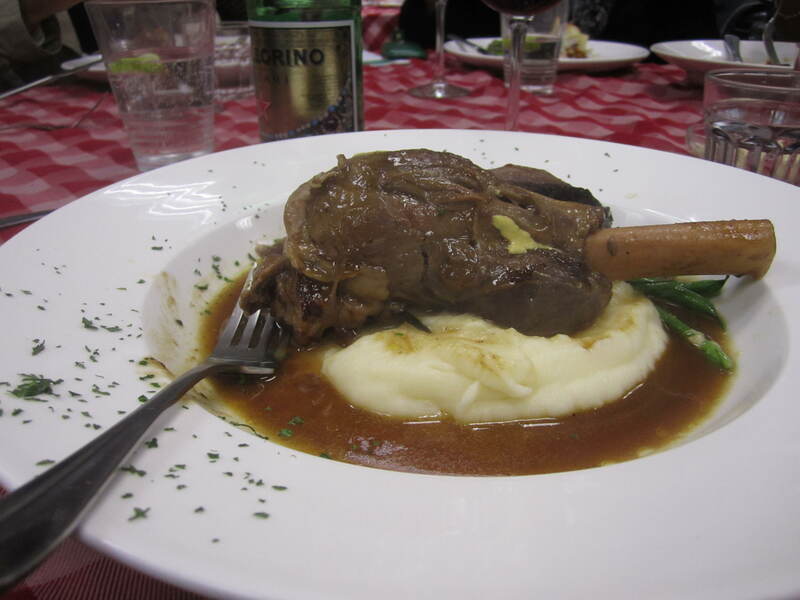 when is a lamb shank cooked to perfection not absolutely divine? The meat slid off the bone and melted in the mouth. Infused with the essence of the Shiraz it was braised in, as well as fresh rosemary, this dish was utterly delicious. How could we not order the signature dish? 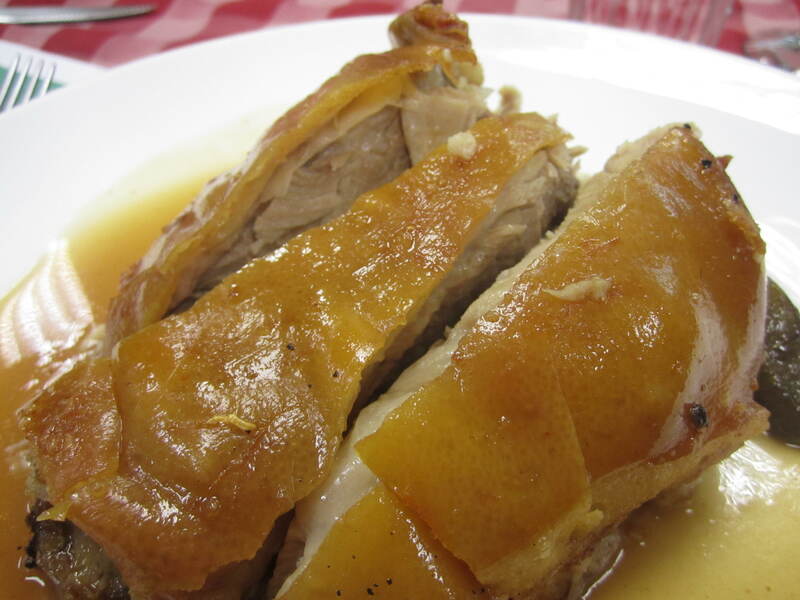 Although the menu changes seasonally (in fact, the spring menu which we tasted has only just started), the Roasted suckling pig will always remain on the menu. Thank heavens for that, as it is possibly one of the better suckling pigs I have ever tasted! Seated on a bed of baked cinnamon apples and kipfler potatoes, the meat was so tender and juicy, the skin so perfectly crackling, that this was certainly my favourite of the main courses. For dessert, although almost bursting at the seams after such wonderfully rich savoury dishes, we shared three between us. 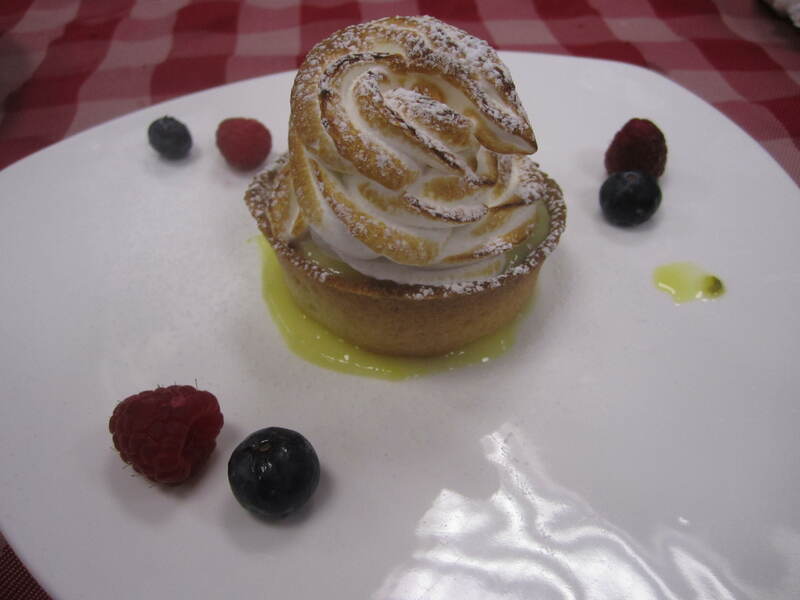 The Lemon meringue tart, something I would not usually order, was delicious, although perhaps the lemon curd was a little on the runny side. The biscuitty base and the marshmallowy meringue were impeccable however. 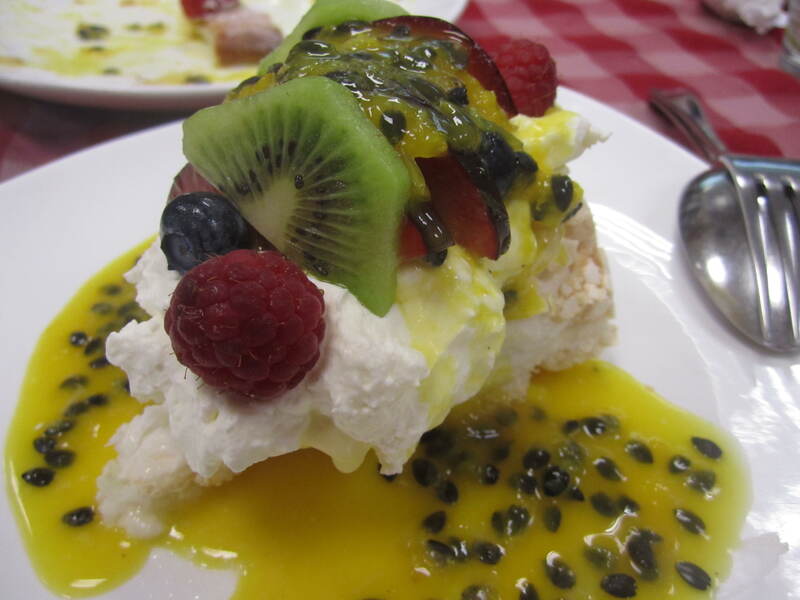 The Pavlova on its own would have been far too sickly sweet for me, but once topped with fresh fruit, and in particular sour passion fruit, a balance was achieved. 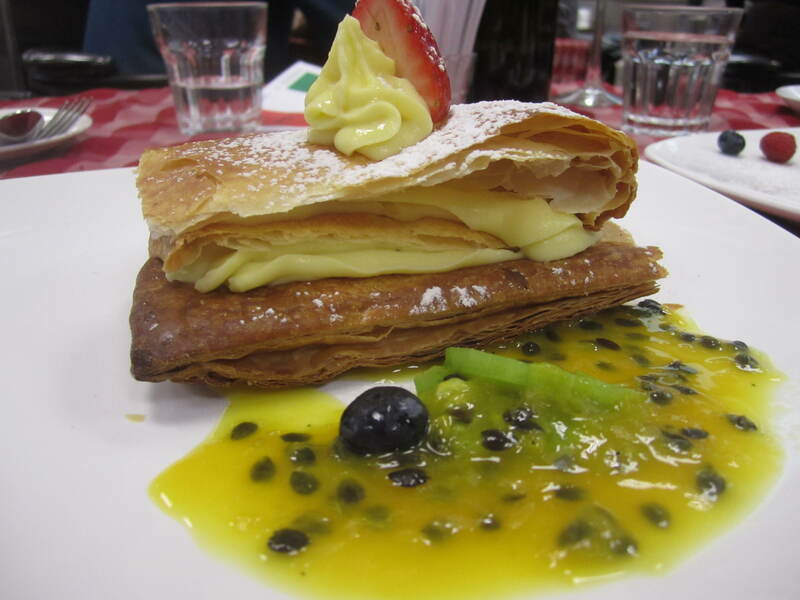 My favourite of the desserts was the Mille feuille with passion fruit custard. Layer upon layer of wafer-thin pastry were sandwiched together with creamy yet tart passion fruit custard and served with fresh passion fruit and kiwi – two of my all-time favourite fruits. Perfection to a tee. The atmosphere at ABC is fantastic, and this all boils down to its location, as you just can’t replicate the energy and excitement you’ll find in a cooked food market. Go with a group, bring your own wine (at zero corkage charge!) and this is bound to be a fun night. The delicious food is just a bonus. Make sure you book in advance, as although they serve 70 covers on an average night, even on a weeknight it is always buzzing. One thing to note about ABC Kitchen is that although it is situated amongst dai pai dongs, the prices are by no means dai pai dong prices. For three starters, five mains and three desserts, plus a bottle of wine (we didn’t plan ahead) we paid $300 a head. Not outrageous under normal circumstances, but just make sure you’re not expecting to pay local prices. However, for fare that is undeniably always going to win in any dai pai dong battle, ABC will have you rushing back regardless of the cost. Trust me.